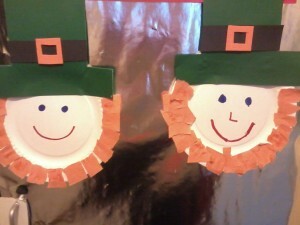 How cheerful are these guys? They are the first thing you see when you come in my front door and I love them. Such happy fellows to greet you when you come home. I’ll be keeping them up there for a while. At least until I find out where they’ve hidden their pot of gold! 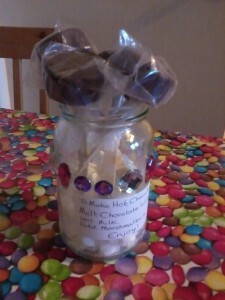 This is the delicious Hot Chocolate Kit we made to give the Mums on Mother’s Day. I don’t normally share instructions for our creations but I think this idea is too good not to share! First gather a clean jar, some little yoghurt pots (petit filous size) or an ice cube tray to use as molds and some lollypop sticks. Melt a couple bars of chocolate – we used milk chocolate but personally I would have preferred dark – in a pyrex bowl over some simmering water. 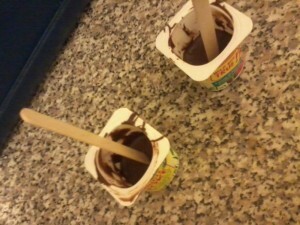 Half fill your yoghurt pots or completely fill the ice cube molds. Place in the fridge to chill for bit. Once they’ve started to set put the sticks in. When they are completely set, remove from the molds. 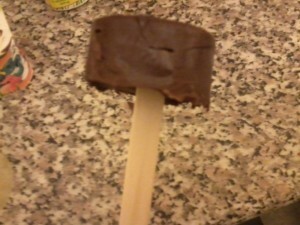 I plunged one into hot water to take it out but the sides were all squidgy and melted. I found the best way was to use just the warmth from my hand. Patience is required rather than brute strength – you’ll just pull the sticks out. 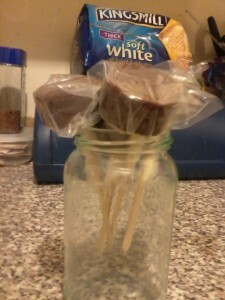 I had some wee plastic bags left from when we made cake pops, so I used those to wrap the lollies and secured with sticky tape. I think cling film would work perfectly well, or you could take the scissors to a freezer bag. Melt the lollies in a mug full of hot milk, add marshmallows, and enjoy! We’re going to be doing a mile for Sport Relief on the 26th of March. You can sponsor us on our Giving Page or pop round and make a donation. Every little helps, and it’s for a fantastic cause. 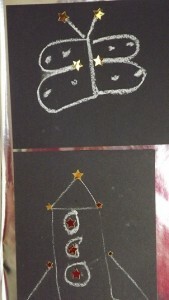 During our Space topic, we had a great time learning about constellations, the solar system and space travel. We used the information we learned from NASA’s kids club website and books from the library to creat some art for our display area. 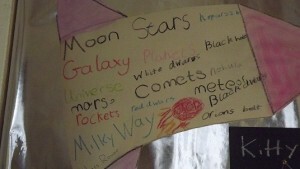 This is our vocabulary rocket – we worked together to share some fabulous space related words. 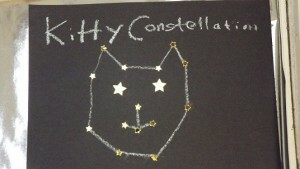 After learning about constellations, and trying to spot some in the night sky we used chalk and sticky stars on black card to create our own. 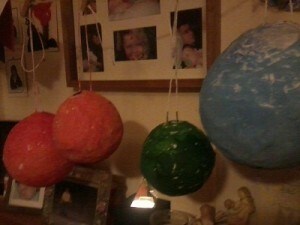 We studied the planets in our own solar system and made planets of varying sizes from paper mache and painted them. Here they are on the line drying. 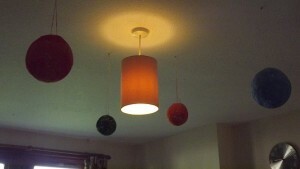 .. and hanging around our “sun” in the living room. I think they look fantastic and brighten up the living room.